Being such an elaborated and outstretched site, obviously many people would like to get a Birdseye view of the site. 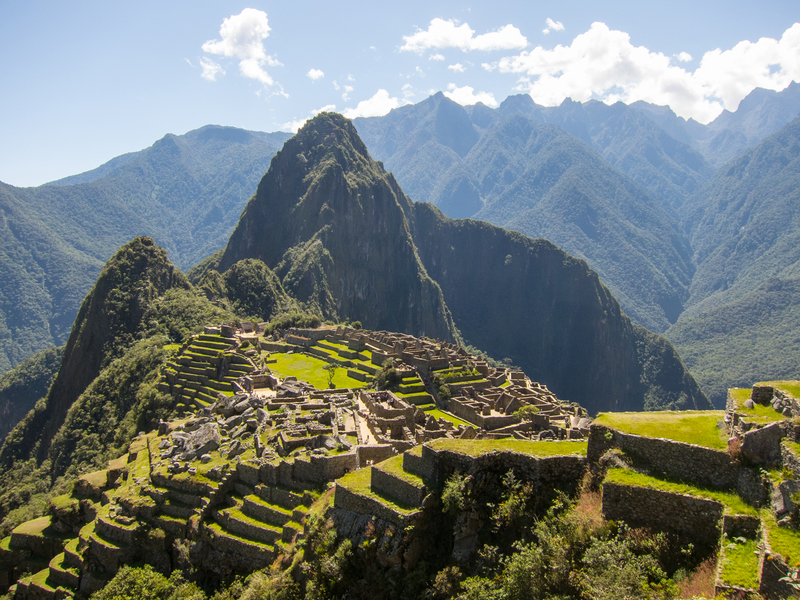 The most famous and known way to see the site of Machu Picchu from above is from the towering mountain behind Machu Picchu, namely Huayna Picchu. Nevertheless as the entrance rules and fees for Machu Picchu & Huayna Picchu have changed recently for many people this is no longer an option. For more information about Huayna Picchu, please click here. Machu Picchu Mountain; across from Huayna Picchu on the other site of the site there is another mountain called Machu Picchu Mountain. Machu Picchu means Old Mountain and this mountain reaches even higher than Huayna Picchu itself. The site has been called after this mountain and together with Huayna Picchu make up for the “saddle” the site is located in. Machu Picchu Mountain used to not have a surcharge but now its the same price as a Machu Picchu ticket with Huayna Picchu and when skies are opening up will give way for some of the best photo moments you will encounter on the site. From here you can see the entire site (even parts of the slopes that cannot be seen from Huayna Picchu) and gasp down into the valleys on both sides of the site. The walk is almost twice as long as the climb to Huayna Picchu but less steep and rocky as the Huayna Picchu climb. The best time of day to visit this part of the site would be around noon. In order to get here, after entering the site of Machu Picchu, take a left and head towards the Sun Gate. Halfway you will see a sign directing you to the top of Machu Picchu Mountain. A round trip will take you about 2.5-3 hours but is definitely worth the effort as you will see the lesser visited sites of Machu Picchu. The Sun Gate; The Sun Gate was the official entrance to Machu Picchu for the Inca Trail coming from the Sacred Valley and Cusco. Here you can find the caretakers hut and see some of the most famous views of Machu Picchu. Most famous pictures are taken from the Caretakers hut half way to the Sun Gate. From the Sun gate you can continue for a bit over the original Inca Trail in order to get an idea of what it is to walk the Inca Trail. Between the Sun Gate and the actual site you can see some large plains which may have been used for agricultural or ceremonial purposes. Putucusi Mountain; this is located on the other side of the Vilcanote Valley. This is a very steep mountain and climbing it is not for the fainthearted. You can get there by leaving from Aguas Calientes via the road to Machu Picchu but not crossing the river. Continue for a bit besides the river until you reach a small dirt road leading off the main road. Continue here for a while until you reach the first stairways. It may be that at times you will find a check post here as this mountain is being visited more and more and since the INC is starting to charge for this mountain as well. As the mountain is being taken more into use, it is also possible that parts of the ladders will be under maintenance. Nevertheless after climbing the first part over rocky staircases, you will reach the first ladders. The ladders are not for the fainthearted as they are not all in the best shape and come with ropes to hold you on to. It is a quite tiring climb but the views once up there are more than rewarding. You will be able to see Machu Picchu from a whole new angle, seen by very few people. However as there is still some confusion about the entrance and the maintenance it may be that you cannot climb this mountain at any time. If you have the time in Aguas Calientes it is however definitely worth checking out.